Instant Pot Chicken Cacciatore is a favorite weeknight meal for me. Ready in 30 minutes, delicious, and can be a low-carb meal or add carbs if you are in that mode! The beauty of this Chicken Cacciatore is that the prep time is speedy and in just a matter of minutes you have a delicious meal! Stop wasting money and calories on fast food and make your own delicious meals like this Instant Pot Chicken Cacciatore! This is one recipe from the family archives. My Mom made a similar recipe when I was a child. To be honest, I didn’t appreciate it as much as I do now. Not sure why I was not completely attracted to this dish! I know, I treat food as a relationship. I haven’t sought therapy yet. The family thinks I am nuts! Chicken Cacciatore, always a family favorite! I love my food! My doctors are always poking and prodding at me. I say let me cook because it helps me relax! This Chicken Cacciatore reminds me of being a young girl in the kitchen with my Mom and she was making this for us with a big bowl of pasta! Now my Mom rarely used a pressure cooker. They were not in the same safety zone as of today’s kitchen tools and Instant Pots! My Grandma did and let me tell you, it did not always go well! I wish she could see today’s Instant Pots and Pressure Cookers, they have come a long way with safety and ease of use! I am taking my families delicious Chicken Cacciatore Recipe and making it in the Instant POT! Super easy, super delicious, super quick! There are a lot of ingredients in this cacciatore. However, it is really an easy dish that once you have cut your veggies and seasoned your meat, the vessel does the work and you can enjoy a glass of wine. 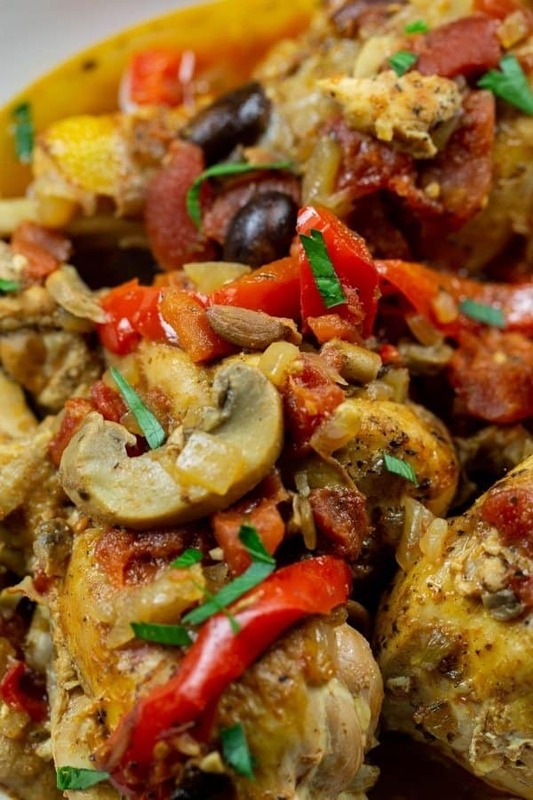 Chicken Cacciatore has Italian roots! Cacciatore means “hunter style”, which includes poultry, onions, tomatoes, vinegar or wine, and herbs. Yes, make a double batch and freeze chicken to eat another day. I use freezer bags to store my chicken. This is a great meal to add to your make-ahead meal plans. Is Chicken Cacciatore a recipe to make ahead and reheat? Feel free to make the recipe early. Reheat in the oven at 325 for 15 minutes. Make Instant Pot Chicken Cacciatore and store the insert with the cooked chicken in the fridge. What sides can be served with Instant Pot Chicken Cacciatore? zoodles- low carb, gluten-free, use a combo of green and yellow zucchini for nice color contrast. pasta: my favorite with chicken cacciatore would be pappardelle pasta. 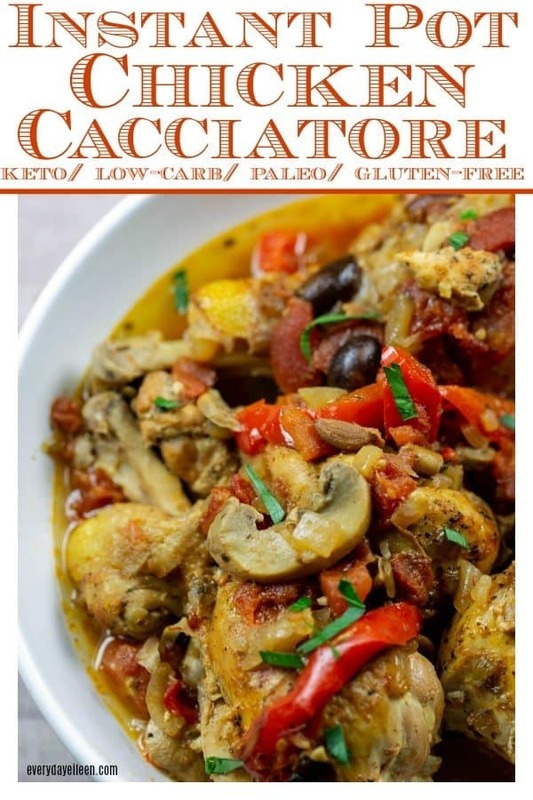 Is Chicken Cacciatore keto, gluten-free, or Whole30? Chicken Cacciatore is a whole food recipe. It is keto. To keep the meal keto, serve with one of my low-carb sides. 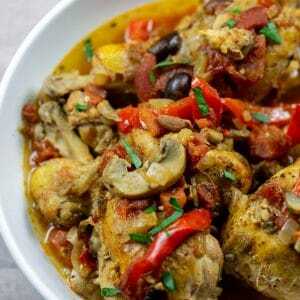 Chicken Cacciatore is a gluten-free recipe. Serve with a gluten-free side. If you want a Whole30 compliant recipe, leave out the wine. Can this Chicken Recipe be made stovetop? Absolutely. If you do not have an Instant Pot or want to make it in a saute pan, the instructions for stovetop are included in the recipe. What are the best cuts of poultry a good chicken cacciatore recipe? I use bone-in chicken breasts and drumsticks. I remove the skin because that reduces fat. If you prefer, leave on the skin on the chicken. You can use boneless breasts or thighs as well. 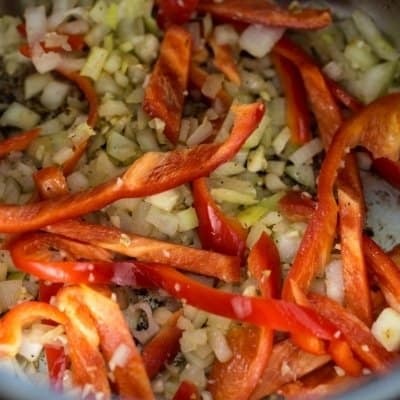 Can any other vegetables be included in making Chicken Cacciatore? Absolutely, Feel free to add your favorite veggies. Add carrots, celery, zucchini, and cauliflower to this recipe. Also, any color pepper can be used in the sauce. 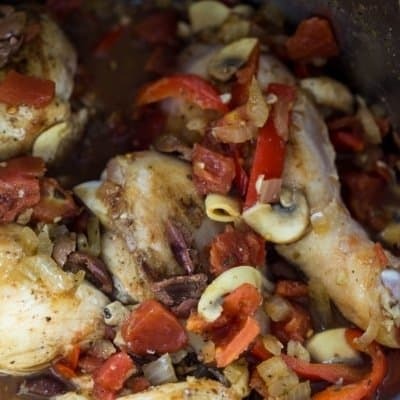 Tips for prepping and cooking Instant Pot Chicken Cacciatore? 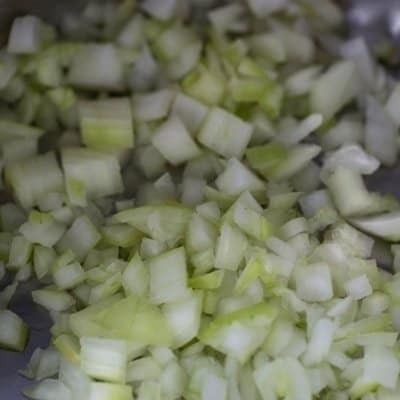 Cut your veggies before beginning to cook so everything is ready to add to the pot. Don’t forget to season and brown the chicken. This adds flavor to the chicken and sauce. Use pieces of chicken that are approximately the same size so they cook evenly. Your chicken pieces should be at 165 degrees when cooked through. When adding the balsamic vinegar and wine to the pot, use a wooden spoon to brush up any brown bits. This adds flavor but also prevents the “burning” message on the Instant Pot. 6-Quart Instant Pot: The instant pot has been a gamechanger for me. When I have no time, I still can have a great meal in 30 minutes. Quicker than delivery service. Set Pot to saute, spray with non-stick spray. Add chicken to brown, remove and set aside. Saute onions and mushrooms about 3-4 minutes. Stir in garlic. Stir in red peppers and mushrooms. Saute for about 2-3minutes to soften veggies. * Add the wine and vinegar to the Instant Pot. Use a wooden spoon to get up any brown bits off the bottom of the insert. Simmer for 5 minutes to reduce liquids. Stir in the chicken stock, diced tomatoes, without juice, tomato paste, basil, oregano, parsley, and black pepper, 2-3 minutes. Then add back in chicken and olives. Cover the Instant pot with the Lid. Set to high pressure for 20 minutes. Natural release for 5 minutes. Turn the valve to open to release the remaining steam. In step 3, reducing the liquids allows the flavors to blend into the chicken pieces for flavor. Low-Carb Chicken Piccata: one of my most popular recipes made with almond flour! Instant Pot Pork Ragu: A hearty red sauce made with pork over pappardelle noodles. Chicken Mole: A recipe with some spice that is perfect over Spanish rice, riced cauliflower or roasted spaghetti squash. One Pot Herb and Garlic Chicken Pasta: A delicious one-pot chicken and pasta meal! One Pot Chicken Chicken and Vegetable Pasta: A one-pot pasta meal that is full of flavor and veggies for everyone to love. Love this Instant Pot Chicken Cacciatore Recipe, I would very much appreciate it if you give it a 5-star rating and share any comments or questions below! Combine the garlic powder, onion powder, black pepper, and salt. Season the chicken with the seasoning. Set Aside. Set the Instant Pot to Saute, add the olive oil. Add in the chicken pieces to brown all sides, about 6 minutes. Once the chicken is brown, remove and set aside. If needed, add another tablespoon of olive oil. Add in the onions, saute for a minute. Stir in the red pepper and mushrooms. Saute about another 2 minutes to soften the veggies. Add in the garlic. Add in the balsamic vinegar and white wine. Use a wooden spoon to scrape up any brown drippings in the bottom of the Instant Pot. (This brings flavor but also helps prevent the burn code on the Instant Pot). Combine in the chicken stock, diced tomatoes, tomato paste, Kalamata olives, bay leaf, Italian Seasoning, and dried parsley. Stir ingredients. Add back in the chicken pieces. Press Cancel on the Instant Pot. Place lid on Instant Pot, lock and turn the steam valve to close. Select pressure cooking, High, 10 minutes. Once the timer goes off, let it natural release for about 5 minutes. Then quick release valve. Consult manufacturers instructions if needed for operating your Instant Pot. Discard bay leaf. Serve the Chicken Cacciatore with your favorite sides. Low-carb choices spaghetti squash, zoodles, mashed cauliflower. Other choices are mashed potatoes or your favorite pasta. Sprinkle with Parmesan Cheese and fresh basil or parsley for garnish. Note 1: I generally use a combo of bone-in chicken breasts and drumsticks. If the chicken breasts are large, I cut them in half. Any nutritional data I provide is an approximation. Actual dietary information can vary based on ingredients and portion sizes. Use a large saute pan over medium heat. Follow the instructions above. However, once the chicken has been browned and all the ingredients have been added to the pan turn heat to low. Cover pan with a lid and simmer stirring occasionally for about 35 - 40 minutes. Check the temperature of chicken which should be 165 degrees when cooked through. My college roommate and I used to make chicken cacciatore all the time! And I don’t think I’ve made it since then…but this delicious recipe is inspiring me to break it back out. I don’t have an instant pot, but I can definitely do it on teh stove. Thank you for this! Absolutely Karyl! 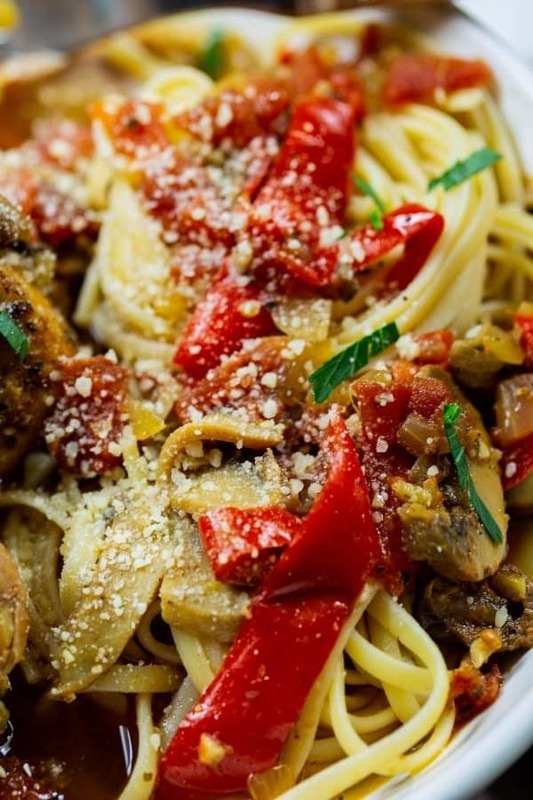 This chicken cacciatore is awesome on the stovetop, enjoy! My family loves Chicken Cacciatore but I never thought of making it in a Instant Pot, brilliant idea! Fabulous Andrea! I hope you enjoy Chicken Cacciatore! Wow, now this is my kind of dinner… so yummy! And it sounds so easy to make in an instant pot, I need to get my hands on one asap! Thank you Sam! It is a favorite of the family too! I am all for bulking up my Instant Pot recipe collection! Chicken cacciatore is soooo good but it’s also so time consuming. I can’t wait to try this in the instant pot – an all day meal cooked in minutes! Lauren, I am so glad you enjoyed the chicken cacciatore! Chicken Cacciatore is a favourite of mine, but I’d never have thought to try it in the instant pot. It makes it so quick and easy! Perfect for a weeknight meal. Elizabeth, the chicken is great in the Instant Pot! I hope you enjoy the recipe! We like to make Chicken Cacciatore, but never made it in an Instant Pot (we do not have one 😉 . I like that it is easy to throw everything together and customize all the add-ins! I held off on an Instant Pot because i grew up with a pressure cooker! An instant pot is amazing! i hope you make the investment! Michelle, oh my, me too! My Granny had a pressure cooker and we said a prayer every time she used it! They have come a long way! These new ip are awesome! I love this instant pot recipe! I’m always looking for more recipes I can make in my Instant Pot! I am so glad you are adding this to your instant pot recipes Jennifer! Enjoy! Instant pot dinners ready in 30 minutes like this are so perfect for busy families! So much flavor, good for you ingredients and easy to make! Perfect! You are so right Sherri! This is a favorite of ours and i am glad you enjoy! This looks so delicious! Instant pot recipes are a winner for quick and tasty meals! Thank you Carrie! i am glad you enjoy! I’ve been making a very similar recipe to this for years but haven’t tried it in my Instant Pot yet. What a great idea to get a dinner on the table so much quicker and with a lot less cleanup. Love your suggestions for keeping it low catb too especially with my new favorite, riced cauliflower. Awesome Linda! i hope you make your recipe or mine in the Instant Pot! It is such a game changer! Enjoy! I simply loved watching the recipe. It looks delicious and scrumptious. Thanks for sharing this. I love watching foodies and people who love t share about food as i am into this business for years now. I will do try this recipe and share my views on it. That is awesome Todd! I am glad you enjoy the recipe and I appreciate the sharing of my recipes! This is awesome Connie! I am so happy you liked the recipe and I hope our family loves it too!